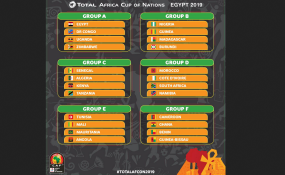 Nigeria, which is placed in Pot One, may paired against one of Ghana, Mali, Algeria and Emmanuel Amuneke's Tanzania when the draw of the 2019 African Nations Cup is made in Cairo, Egypt today. The ceremony will hold behind the famous Giza Pyramids 7.00 p.m. Nigerian time. This year's competition is the biggest Africa Cup of Nations finals in history, as it would feature 24 teams against three teams that took part in the first edition of the competition in Sudan 62 years ago. Hosts Egypt (who have also won the competition the highest number of times - seven), Cameroun (five -time winners and Cup holders), Nigeria (three -time winners), 2004 champions Tunisia, Senegal and 1976 champions Morocco are the seeded countries in the draw. In Pot Two, from which one team will join Nigeria's group, are DR Congo, Ghana, Mali, Cote d'Ivoire, Guinea and Algeria. Pot Three has South Africa, Uganda, Benin Republic, Mauritania, Madagascar and Kenya, with one of them certain to join the Eagles group, same with Pot Four, which has Zimbabwe, Namibia, Guinea Bissau, Angola, Tanzania and Burundi. The 2019 Nations Cup will hold from June 21 to July 19 in six venues, including Cairo International Stadium; Borg El-Arab Stadium, Alexandria; Suez Stadium; Air Defence Stadium; Ismailia Stadium; and Al Salam Stadium. According to thenff.com, Nigeria Football Federation (NFF) President, Amaju Pinnick, who is also CAF's first vice president, is also the President of the AFCON organizing committee. He will be joined at the ceremony by the NFF Secretary General, Dr. Mohammed Sanusi, who arrived in Cairo on Wednesday. "Pinnick has been in Cairo since the beginning of the week, leading final inspection teams across the various stadia, and chairing the AFCON committee meeting on Wednesday," it said.